The essential plant of the late summer border, the Japanese anemone is in full bloom now, it’s tall and simple yet elegant flowers lighting up a shady corner. The Japanese anemone (or windflower) is actually from China, and was first sent to the Horticultural Society in 1844 by the great plant hunter Robert Fortune. He had discovered it in Shanghai where it was growing in the cemetery ‘in full flower among the graves of the natives…and is a most appropriate ornament to the last resting-places of the dead… [For] the flowers which the Chinese plant on their tombs are simple and beautiful’. The colour of the windflowers generally seem to be around just a few shades of white to pale pink to carmine; but the newish hybrid ‘Dreaming Swan’, bred by Elizabeth MacGregor in Scotland has a completely new colour break and is so pretty. The flowers are large, semi-double white, with an unusual shade of lavender on the back of the petals, whilst the slender stems have a lovely purpley tone to them. They close their slightly downturned flower each evening so that you can see the lovely mauve backs of the petals and then during the day they open again and face upwards showing their white petals - a ‘dreaming swan’ indeed! 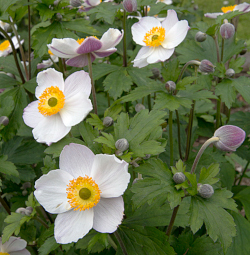 They start to flower much earlier than most Japanese anemones, and keep going with a long flowering season all through the summer until the first frosts. Generally once established the Japanese anemone can be a bit invasive, taking over an area (and sometimes difficult to get rid of if you change your mind about its position), but it can be slow to get going sometimes taking a year or two to settle down. It also quite often creeps to somewhere with cooler ground that it finds more suitable. ‘Dreaming Swan’ is seemingly better behaved, and makes a tidy clump not invading its neighbours. It likes a rich, well-drained soil, but does not like to get too dry. ‘Dreaming Swan’ looks lovely in both border and cottage garden settings, and also works well in a wilder setting or naturalistic prairie style plantings – which I would love to do if only I had a bigger garden!